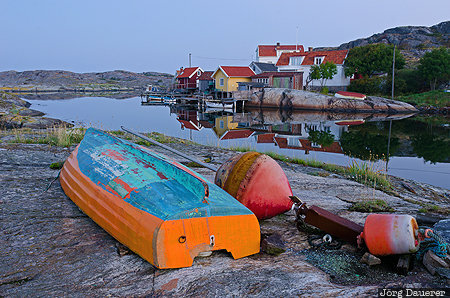 A colorful wooden boat and houses of Björholmen and their perfect reflexion in the calm Baltic Sea in the background at the blue hour before sunrise. Björholmen is on the island Tjörn in Västra Götaland in the south west of Sweden. This photo was taken in the morning of a sunny day in September of 2014. This photo is in the Photo Calendar "Südschweden". This photo was taken with a digital camera.